Lot 19375 - Gordian III (238-244). AR Antoninianus, 241-243 AD. Obv. IMP GORDIANVS PIVS FEL AVG. Radiate, draped and cuirassed bust right. Rev. IOVI STATORI. Jupiter standing facing, head right, holding sceptre and thunderbolt. RIC 84. AR. g. 4.64 mm. 24.00 EF. Lot 19381 - Gordian III (238-244). AE Sestertius, 241.243. Obv. IMP GORDIANVS PIVS FEL AVG. Laureate, draped and cuirassed bust right. Rev. LAETITIA AVG N SC. Laetitia standing left, holding wreath and anchor. RIC 300. C. 122. AE. g. 19.44 mm. 29.40 Good VF. Lot 19383 - Gordian III (238-244). 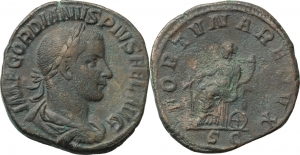 AE Sestertius, 241-243. Obv. IMP GORDIANVS PIVS FEL AVG. Laureate, draped and cuirassed bust right. Rev. PAX AETERNA SC. Pax running left, holding branch and sceptre. RIC 319. C. 169. AE. g. 19.21 mm. 30.00 Good VF. Nice green patina. Lot 19384 - Gordian III (238-244). AE 27mm, Anchialus mint, Thrace. Obv. Facing bust of Gordian III and Tranquillina. Rev. Demeter standing left, holding corn-ears and resting on long torch. Varbanov 684. AE. g. 13.16 mm. 27.00 VF. Green patina. Lot 19385 - Gordian III (238-244). AE 28mm. Nicopolis ad Istrum mint, Moesia Inferior. Obv. Laureate, draped and cuirassed bust right. Rev. Zeus standing left, holding patera and sceptre; eagle at feet. Varbanov 4249. AE. g. 14.55 mm. 28.00 Dark green patina. Good VF. Lot 19600 - Gordian III (238-244). AE Sestertius. Obv. IMP GORDIANVS PIVS FEL AVG. Laureate, draped and cuirassed bust right. Rev. IOVI STATORI SC. Jupiter standing front, head right, holding sceptre and thunderbolt. RIC 298 a. AE. g. 17.68 mm. 29.00 Very nice brown patina with turquoise hues. EF/Good VF. Lot 19894 - Gordian III (238-244). AE Sestertius. Obv. IMP GORDIANVS PIVS FEL AVG. Laureate, draped and cuirassed bust right. Rev. IOVI STATORI SC. Jupiter standing front, head right, holding sceptre and thunderbolt. RIC 298a. AE. g. 21.35 mm. 32.00 VF. Brown patina. Lot 19895 - Gordian III (238-244). AE Sestertius. Obv. IMP GORDIANVS PIVS FELAVG. Laureate, draped and cuirassed bust right. Rev. FORTVNA REDVX SC. Fortuna seated left, holding rudder and cornucopiae; under seat, wheel. RIC 331. AE. g. 22.64 mm. 31.00 VF. Brown-green patina.